Part One: the Klan of Reconstruction—The Klan was active in Michigan as early as 1868. This 55-minute installment tells of the start of the Klan and its spread into the state. We feature interviews with Dr. Randall Jelks, Frank Boles, Dr. Bill Cohen, Dr. Norman McRae. Music composed and performed by producer David Schock. The DVD is available to individuals for purchase at $25 (plus $5 for tax, shipping, and handling). The institutional price is also $25 plus $5 for shipping and handling. To purchase the DVD, please click the corresponding PayPal button. Part Two: THE Movie—the 1915 pioneering work of David Wark Griffith—The Birth of A Nation—set the stage for the rise of the second Klan. 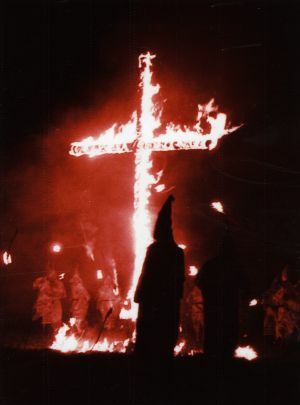 Led by an inveterate joiner, William Simmons, the second Klan turned into a business as well as a way for white men to express their outrage over the influx of Eastern Europeans, Roman Catholics, and Jews. Oh, sure, they still hated Black Americans, too. But it was the movie that started it all. Estimated completion: ?? ?